Microsoft chief executive officer Satya Nadella announced long-rumoured job cuts on Thursday. In a memo to staff Nadella said the company would cut up to 18,000 jobs over the next year, or 14 per cent of the company’s workforce, as it realigns its corporate resources to focus on mobile and cloud and integrates Nokia within the wider business. The cuts are nearly three times the size of those the company made in 2009, when it laid off 5,800 staff – mostly from the company’s mammoth (at the time) marketing organisation. Nadella said Microsoft’s integration of Nokia’s handset business, which it acquired for $7.2bn last year, is one of the key drivers of the cuts. “Our workforce reductions are mainly driven by two outcomes: work simplification as well as Nokia Devices and Services integration synergies and strategic alignment,” he said. The company said it wants to eliminate multiple layers of management and slim down business support processes as it works to drive synergies between Nokia and Microsoft’s cloud services. The job cuts were anticipated for some time now but few have had any sense of the scope or size of them. 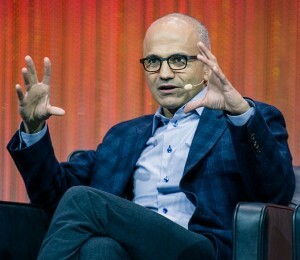 Nadella was recently quoted by the associated press as saying “nothing is off the table” as he steers the company towards a cloud and mobile-focused future, and helps the company regain its position as the dominant force in enterprise productivity software and services. The company employs about 127,000 staff globally.